The Ambassadors in Blue are looking for a few good airmen to join their team, according to Air Force Personnel Center officials. The 138-member unit is looking for some new blood among officers and enlisted members willing to make multi-year commitments to the team that performs up to 75 demonstrations a year in the U.S. and abroad, according to AFPC. Officers selected to the team serve a two-year assignment and enlisted members serve three or four. The team is looking for a demonstration pilot, operations officer, executive officer, maintenance officer and public affairs officer, according to AFPC. 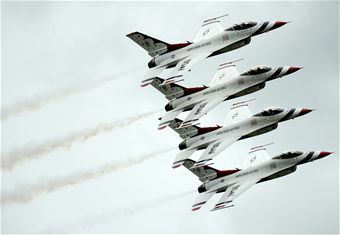 Known officially as the U.S. Air Force Air Demonstration Squadron, part of the Thunderbirds’ fame comes performing precision aerial maneuvers that demonstrate the capabilities of the Air Force F-16 to people, but the team also has other responsibilities, according to the Air Force. Team members support recruiting and retention, reinforce public confidence in the Air Force and help strengthen the morale and esprit de corps among airmen, according to the squadron’s mission statement and objectives. If you’re interested in applying, go to the secure Air Force Personnel Services website at https://gum-crm.csd.disa.mil.